It is important to understand that different species of raw materials have distinct traits. These traits include different fiber and lignin contents which usually affects the cohesiveness of the pellets. Additionally, different cohesive values of the raw materials call for different compression ratio of the pellet mill die mold. For instance, the hardwood require a lower compression ratio while softwood require a higher one. For example beech requires a compression ratio of a ring die of 7.5:1, bangkirai, meranti batu, and cruing require a compression ratio of 5: 1, and hardwood eucalyptus require a ring die of the compression ratio of 4.5:1. It is important to note that the raw materials that are hard to pelletize require to be mixed with a binding agent such as clay, vegetable oil, starch, wax, or oil. This should be carried out from time to time. The raw material in the pelletization process passes through steam generated by the high pressure and temperature conditions. The vapor is acts as a catalyst to keep the raw material softened and cured to strengthen its cohesiveness. This is another important factor that affects pelletization process and your investment in the pellet plant. Varied sizes of materials require different technological processes for the design of the pellet production plant. For instance, materials need to be reduced into required sizes using either a hammer mill, wood chipper, wood crusher, or a wood debarker. For example if you use the rice husks for your raw materials, then there is no need to have any kind of crusher such as the hammer mill to reduce the sizes of the material into a standard length of between 4mm and 5mm. 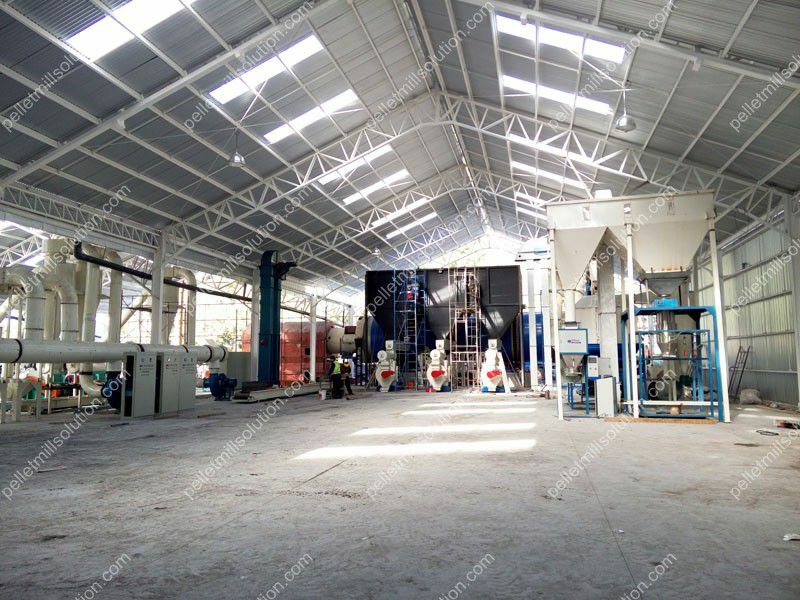 However, in cases where tree twigs or branches, wood logs or wood blocks are used as the raw materials, then the machines mentioned should be employed before pouring the materials into the pellet mill. The machine used will also depend on the size of the material used. This, therefore, means that your budget and investment in the pellet making plant should take care of the pre-treating equipment. The materials that are longer than the standard length do not pass through the pores of the ring die smoothly. The pellet market demands that the diameter of the pellet should range between 6mm and 8mm. Additionally, the performance of the pellet mill is affected by the flow of electricity. If the electricity current keep fluctuating, it will cause damage to the pellet mill and the resulting pellets will be of low quality. The pellets produced in such a case will be too much mealy and of low formed pellet yield. This factor will determine whether there is need of a drying system in the pellet manufacturing plant. Statistics and research show that the most suitable moisture range that is commonly used is 13% to 15%. However, the materials such as fresh wood or agricultural- based waste should be dried before feeding them in the pellet mill. Also, the raw materials that are exposed in the open air such that they have been dampened by rainwater or soaked in snow water require their moisture levels to be lowered. Nevertheless, if such materials with excessive contents are milled before drying, they will just stick together like paste. Such materials will also affect the performance and efficiency of the pellet mill. This, will therefore, call for an adjustment on your budget to cover up the losses. Different types of raw materials can be mixed and milled together or you can just mill one type of material at a time. There are suitable projects offered based on your demands but the thing is to secure the stable performance of the mill. If using different kinds of raw materials, then ensure they are blended proportionately and thoroughly. Otherwise, the pellet mill will be compelled to chew various materials from one type to another thereby triggering burping or chocking of the pellet mill. This usually leads to instability issues in running of the mill and producing some noisy sounds. The pellet mill does not usually produces no sound when running. This, therefore, means that various materials should be blended decently to achieve a smooth pellet production. This implies that different technological processes should be put into practice and the mixer will boost the performance of the pellet mill. The technological processes used will have an effect on your budget. Drum Chipping: The harvested wood is pre- processed using a wood chipper to reduce their size to the required length of less than 6mm. Screening: Here the impurities are screened and removed from the raw materials. These impurities include such substances as metals, stones, etc. Drying: The raw materials are passed through the drum drier to achieve the desired moisture content of between 12% and 18%. The drum drier is the standard for the wood pellet production plant. Pelletizing: The raw materials of sufficient size and moisture level are channeled through the die openings under great pressure. This process extrudes the soft and hot pellets. Cooling: Here the hot and soft extruded pellets are hardened and strengthened by air cooling. Packaging: After cooling the pellets are packaged into bags to allow for pellet production and convenient distribution. Storage and Distribution: The pellets should be kept under dry conditions and stored in containers, tanks, or silos. The pellets are often distributed in bulk form by truck or any other carriages or in bags. Construction of a biomass pellet plant involves detailed negotiations and constant conversations. It is, therefore, important that each equipment supplier who is responsible enough understands the point. Kingma, a professional pellet plant and supplier, is committed to offer consistent and best solutions to all your pellet feed issues. Our work is reliable and our equipment are dependable and effective.